Big surprise here -- I recently read another book that takes place at the beach! This time it's SEA CHANGE by Karen White. I decided to pick up this book because it's been awhile since I've read and reviewed a Karen White novel (and I always like her writing), but also because this book seemed to be a little different than the typical beach book! It was part mystery, part supernatural tale, part historical fiction, and part love story; and I really liked it. 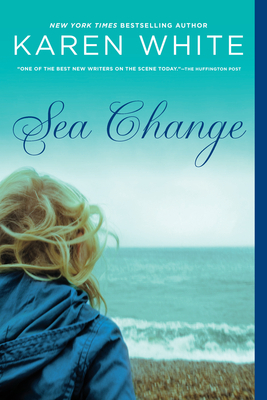 SEA CHANGE tells the story of Ava, a woman who is on the brink of her new life! After a whirlwind romance with child psychologist Matthew, she marries him and moves to his home in St. Simons Island -- away from her family. Once she is there, she discovers that she doesn't know Matthew as well as she thought; and she learns that there is a mystery surrounding the death of his first wife. While Ava hoped that she had finally found her place in the world with Matthew and St. Simons Island, she realizes that all of her husband's secrets make her feel like even more of an outsider. She begins investigating her husband's family history and the island's history, and she discovers that she has a strange connection of her own to the island. Ava searches to find the answers to all of her questions and hopes that she can save her marriage and herself. Another thing that worked in SEA CHANGE was how Ms. White told this story. I really appreciated that there were elements of mystery woven into the story. Not only were there secrets surrounding Matthew and the death of his first wife, but there was also a mystery about the island and its past. In addition, there was even a mystery about Ava's past and her family. One of the main reasons I kept turning the pages was to discover these secrets and have some sort of resolution to the mysteries. Ms. White also used a variety of effective techniques to tell this story. I liked that Ava's chapters were written in Ava's voice because I thought it gave me an inside look into her thoughts and made me better appreciate her character, but I also enjoyed the flashback/historical chapters which were written in Pamela's voice. Additionally, I liked that there were a few sections written in Ava's mother's voice since she obviously knew some secrets about Ava and her early childhood. Without a doubt, SEA CHANGE would make an interesting book club pick. The book has some very interesting characters, but it also touches upon some relevant issues. There is a reading guide available with twelve thought-provoking questions. Some of the themes you might want to explore include secrets, love, marriage, parent/child relationships, trust, and intuition. There are also some questions concerning the setting and the way Ms. White wrote this story. Karen White has a huge following and it's no surprise to me. She is a wonderful storyteller and SEA CHANGE is very entertaining novel. I knew there was a supernatural element to the book but figured I'd like it since Karen White wrote it. I'm glad to see you liked it so much. Oh I've been wanting to read this. Glad it was a winner. Still hoping to get the chance to read this! Another friend on Goodreads loved this book too. I really enjoyed this one, too. I think White does a great job merging the past and present. I have enjoyed the Karen White books I have read which have all been the Tradd Street books. I haven't tried any of her standalone books yet. I've never read this author, but I love this book cover! The story sounds good, too. I'll be adding this one to my Tbr. Thx!